Just three months after getting shot at, and the same week the charges that were filed against the alleged shooters were dropped, rapper Waka Flocka Flame returned to Charlotte today. Waka is here for the Dub Show Tour, a car show event that also features a concert and makes stops in several cities, and is taking place at Charlotte Convention Center from 3 p.m. to 9 p.m. In addition to Waka, other rappers performing include Yung Joc, Ace Hood, Kia Shine, locals Bettie Grind, King Carter, and others. Waka has appeared at several of the Dub Show dates so I understand that he wants to honor a contract he likely has in place, but when the show ends at 9 p.m. tonight, he should've been planning to hightail it out of here. Instead, Mr. "Hard in the Paint" is being hard in the head, and is hosting an after-party at Club 935. Waka is one of those rappers I can't stand because he glorifies violence, drugs, and gang activity in his music and says that he "keeps it real." He's a real idiot, and it's because of the music he makes that trouble follows him. In February, he took his tour bus to the Car Stereo Warehouse on Independence Boulevard to get the sound system upgraded--I'm still not clear as to why he chose Charlotte to do this because I don't think he had a show scheduled here that day. But while there, two cars pulled up and at some point the men in them fired shots at Waka and his crew. The police arrested six men a few days later, but just this past Monday the Mecklenburg County District Attorney dropped the charges. Basically, the ignorant-@ss "no snitching" policy in the hood prevailed because none of the witnesses would identify the suspects. "I'm not thrilled about having to dismiss these charges. Some of these guys have felony records," District Attorney Andrew Murray said. 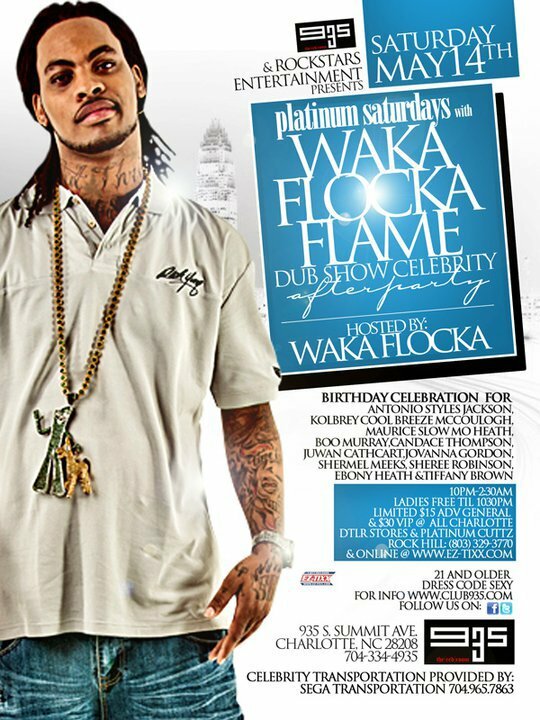 Plus, in May 2010, Waka was performing at a nightclub in east Charlotte and a shootout broke out afterward. There's no evidence as to whether any of his actions caused it, but that's two shooting incidents in a year in the same city in which he was present. That's why he should not be at Club 935 tonight. That club does have some of the tightest security around (still, I'm surprised they booked him so soon after his last incident here), but this is more about Waka's ignorance and inability to make good decisions. He knows people are out to get him, yet he chooses to go to a club tonight for an event that will last until the wee hours of the morning. And who's to say that affiliates of the men who shot at him three months ago won't be present tonight? He won't admit it, but most of the trouble that follows him is because of his gang affiliation. And if it's not that, then it's an attempt to rob him of his fool's gold, I mean, jewelry. That's what was alleged to have been the cause of the February shooting here, as well as when he was shot in Atlanta last year. Let's hope he makes it out of Charlotte tonight without any incident. And maybe one day Waka will wise up.